Franz Mark Johansen is a painter, sculptor, and art professor. He is credited as the founder of the LDS contemporary art movement. 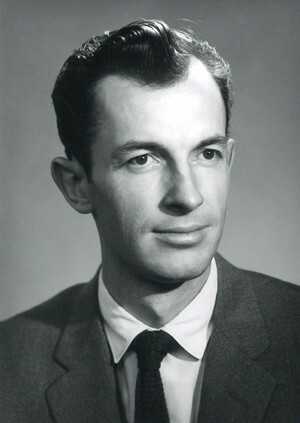 Johansen was born on May 10, 1928, in Huntsville, Utah. Although artistic as a child, his artistic exploration and training was late starting. It wasn’t until he was serving his mission for The Church of Jesus Christ of Latter-day Saints that his passion for art began. The literature, culture, and museums in London, England, impressed him and inspired him to express his religious beliefs through visual art. Johansen earned his BA and MA degrees from Brigham Young University. He also studied at the California School of Arts and Crafts, the Illinois Institute of Design, and the Academie de la Grande Chaumiere in Paris. Diversely, he also studied underwater and microscopic life forms at the Marine Biology Institute at the University of Miami. For more than thirty years, Johansen taught in the BYU Art Department. He retired in 1989. His famous Resurrection Series combines a group of eight paintings and eleven sculptures, all depicting various facets of the resurrection of Jesus Christ. 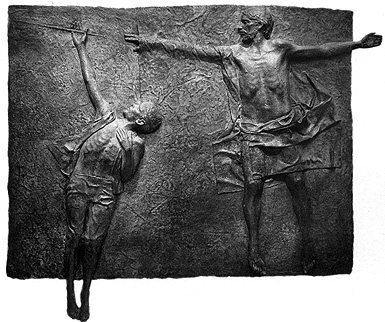 In the area of architectural sculpture, Johansen created the bas relief stone panels that adorn the Harold B. Lee Library and the bronze relief that graces the Joseph Smith building, both at BYU. He created the stone relief on the LDS Church Museum of History and Art in Salt Lake City. He created the doors of the Seattle Washington Temple and the Washington D.C. Temple. 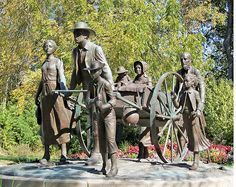 His son Nathan is a sculptor and together they created a sculpture for the visitors’ center in Winter Quarters, Nebraska, for the Sesquicentennial celebration of the pioneer trek to Utah. Johansen married his childhood sweetheart, Ruth Aldous. They have seven children. She passed away in 2001. This page was last edited on 27 September 2014, at 12:42.